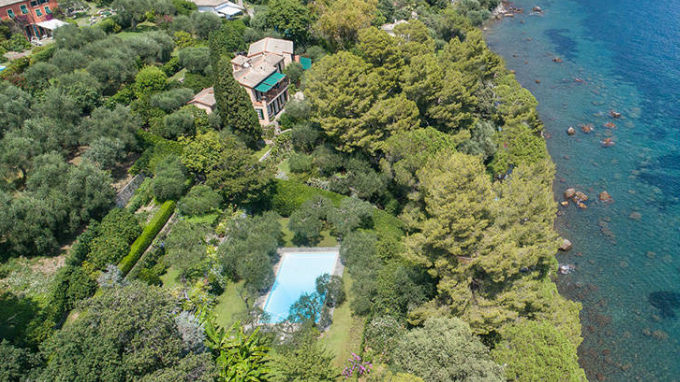 This stunning luxury villa for sale is in Portofino and overlooks the charming Ligurian sea. This property has been recently renovated by its current owner, who maintained its natural features with great attention to detail. This two-storey estate measures 560 m2 and can be easily divided into two residential units with independent access and a private garden. The ground floor is home to the living area, which features a number of living rooms, two kitchens and a laundry room. This level is also home to a bedroom and two bathrooms. A charming staircase leads us to the upper floor, composed of six double bedrooms, six bathrooms and three wonderful terraces running along the villa, offering a breathtaking view of the sea. This prestigious estate is surrounded by a park measuring approximately 1 hectare, home to a big variety of plants ranging from Mediterranean forests to tropical plants, fragrant bushes to centuries-old olive trees and pine trees. This luxuriant park is also home to Santa Margherita Ligure's most majestic swimming pool. This extraordinary haven of rest is the perfect place to relax in utmost privacy, enjoying its proximity to the sea, the breeze and a fantastic view. Art Nouveau Luxury Villa For Sale in Forte dei Marmi. This 500 m² Villa For Sale has a well positioned beautiful heated swimming pool in its 1,500 M².